This past weekend Julie and I made our yearly trek to Chicago for a comic book convention. In years past we had always gone to Wizard World/Comic Con, but the last couple of years we’ve been less-than impressed with the August con. Last year we decided to try out C2E2 which is earlier in the year. We liked it, so we decided that was the one for us and we went again this year. Being the third year in a row, the con managed to impress again. They moved it to a larger convention hall, and it was still packed. Where Comic Con seems to feature $80 autographs from celebrities that are already rich, C2E2 puts the emphasis on writers, artists, vendors, and general entertainment, much like Wizard World used to. Overall it was a great Saturday spent with my wife, packed together with several thousand people that share our interests. Crowds of costumed fans, ravenous art collectors, comic book hoarders, gamers, and bright-eyed kids filled the place with the sense that that was the place to be. I was able to meet the guys from Cyanide and Happiness who were selling T-Shirts and posters at a booth. They were having a blast doing sketches like the one here, for people who came to buy something. That is a picture of them doing one for me, and no, I won’t be posting the entire picture you’ll have to use your imagination. It is not at all appropriate for mixed company. I got a great T-Shirt, and a signed poster, and they threw in this sketch for free. I didn’t mind shelling out the coin for the shirt, something I would have bought at some time anyway, and unlike some these guys weren’t charging for these huge pieces of original artwork. The way they were doing these was one guy started on one side of the paper, while the other guy started opposite. They didn’t really look at what the other was drawing and when they met in the middle they just sort of made it work. We watched in shock and awe as they finished this piece, and when they were done they both sat back and looked at it, one saying “What the f… is going on in this picture?” I look at it still and ask myself the same thing. 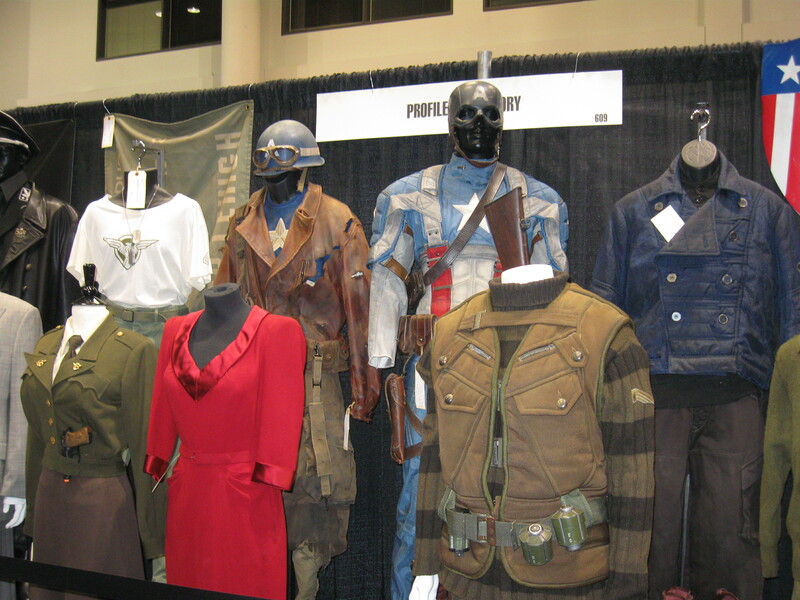 One of the cool things we saw were the pieces that were included in the Captain America auction. These are real pieces from the movie, costumes, props, etc, all worn by the actors for the first movie. They also had the motorcycles, weapons, explosives, and various sundry on display. I’ve never been that close to so much from a blockbuster movie, and I was impressed with the quality. I know it’s quite easy to take a cheap costumes and make them look good in a movie, but these were very high quality props. I really liked that brown vest on the lower right, and had I come to the convention with way too much money to blow, I could see myself wearing that all the time. *GASP* I know, right…wear a valuable movie prop as regular clothing?! Yes, yes I would. I also open the packages of actions figures so I can get them out and pose them, and I read all of my comic books with my bare hands. To me, what’s the point of spending money on something if you are just going to lock it away and look at it. I want to get it out and enjoy it. We saw a few celebrities there, and of course they were charging for autographs. That’s fairly standard and no surprise. Some of them aren’t working right now, and sure, in some cases they need the money. Not going to begrudge a guy who devotes an entire weekend of his time to ‘work’ even if it is just signing stuff at a convention. I would imagine part of it has to do with not being mobbed too. 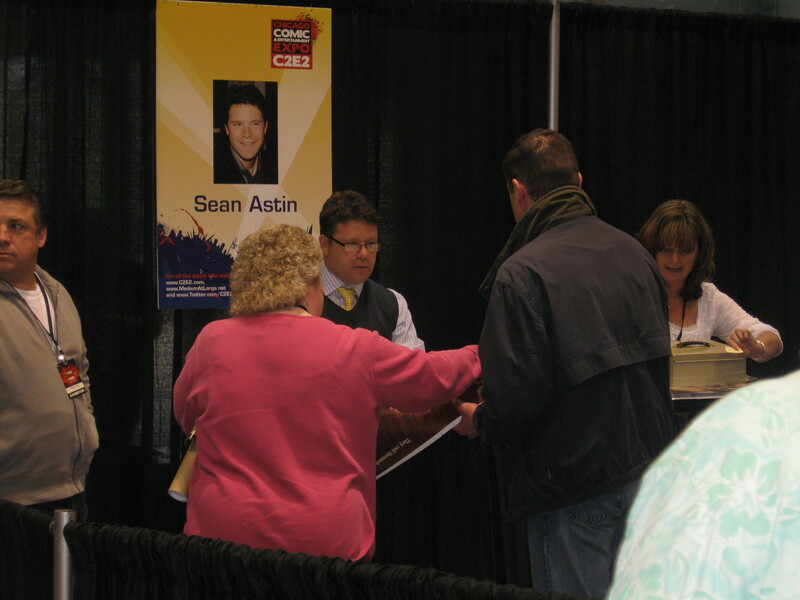 Can you imagine how long the line would be for Sean Astin if he wasn’t charging a dime for his sig? Anyway, not going to bore you with a list of names, you can look that up at the link above. There was some cool celebrity related news though. I was told by another convention goer that Anthony Daniels (C3PO) walked the convention floor and took pictures with fans. Also heard that on Friday Shia LeBeouf showed up last minute to promote his self-published, three issue comic. From what I hear he wasn’t charging for autographs, and was great to his fans despite the massive line that formed once people realized it was him. Also featured, and one of the main reasons I go, are new and upcoming writers and artists. 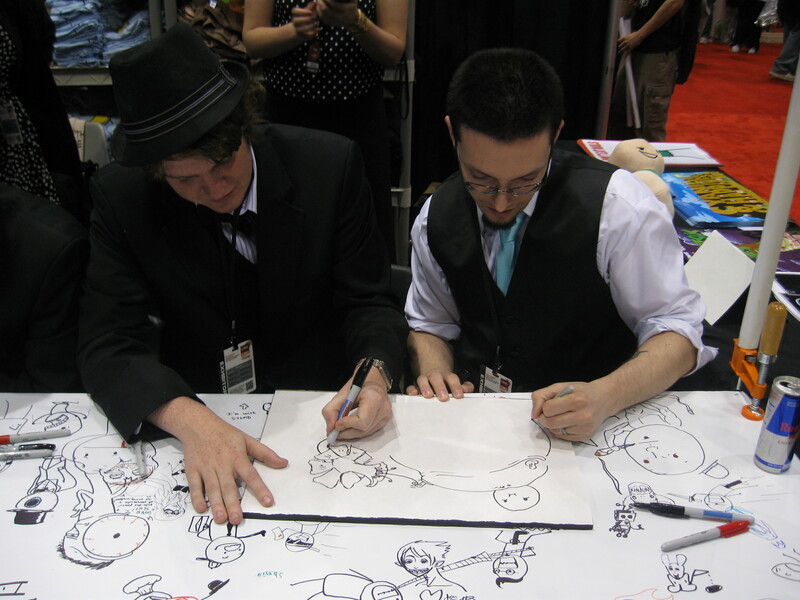 I got a picture of JP Roth, a freelance writer and author turned comic book creator and more. I picked up a copy of her new comic and a print for a very reasonable price. She was nice, easy to talk to, and very excited about her project. The artwork in her project was great, for a small press publication, and the writing in the issue I got was good. It was more of a preview for a line called Ancient Dreams, but it was still a great read. I like meeting the artists that aren’t mobbed because they have been working on the major titles, and seeing the writers, cause that’s what I am, and I don’t think they get enough support honestly. A lot of people collect comics for the story, but in all honesty bad art can ruin an amazing story any day. I know I’ve stopped reading some runs of regular comics due to poor art, and I feel bad for the writers, but I just can’t pull myself through the book if the art looks like a 5 year old drew it, or is so pretentious and artsy it belongs on anything but a comic book. So overall the trip was great. I have some upcoming advice for convention goers, but I think I’ve packed enough into this post. Don’t want to lose you all to boredom. If you are close to Chicago next spring, and have any interest in comics, art, action figures, toys, pop culture, costumes, authors, movies, games, or anything else that’s fun, you should go. Get your tickets early and save money, and I’ll see you there.